In my last blog post, I recommended three alt coins to look out for: WorldCoin (WDC) , NXTcoin (NXT), and DogeCoin (DOGE). For those of you who followed my recommendations, I hope I helped you to make a decent profit. But for those of you who didn't, fret not, because there were 10 altcoins launched in the last 2 weeks alone, and so definitely more opportunities & recommendations coming your way! I think one of the best ways to trade altcoins is to invest early in new, technically innovative, and strong (community, branding, developers) cryptocurrencies. Typically, I look out for certain technical aspects in a cryptocoin, including fast transaction times (1 minute or less), higher security, being able to overcome certain limitations Bitcoin possesses, or factors that can potentially give the altcoin more value. I also covered some important aspects of a cryptocurrency, such as marketing, branding, development and community in an earlier post here. WDC has risen from 0.0003 WDC/BTC to its current rate of about 0.0006; a 2x increase. NXT has risen from 800 Satoshis (0.00000800) per NXT, to a current price of 5500 Satoshis; a 6.8x increase. DOGE has risen from a low of 30 Satoshis per DOGE, to a high of 200 Satoshis (6x increase), and is currently trading at 85 Satoshis (3x increase). As you can see from the previous post, both new coins (NXT, DOGE) made a good 6 fold increase, and I believe that we can expect the same huge growth for almost all subsequent new potential altcoins. The altcoin scene is growing at an exponential rate, and I will do my best to keep up with new coins and give you guys good recommendations. On a side note, it is interesting to see that even new clones (with no innovation) can end up gaining 10x or more value, so maybe it's all just a matter of first-mover advantage? And I'm not referring to DogeCoin, because I personally think DogeCoin has tremendous value in it's reach and backed up by a large community with a common emotional bond to the Doge meme, which matters A LOT in branding. So in this post, I want to cover another 3 cryptocoins to watch out for over the next weeks and months. 2 of them are so-called "2nd generation" cryptocurrencies, which have gained popularity recently since NXTcoin's rise to fame. It could be very interesting to see how these (and other newer) 2nd generation altcoins will develop over the next year, and what they can bring to the cryptocurrency table. Will these 2nd generation coins really be the beginning of something new, and spawn a new era of cryptocoins that have significantly more value/benefits than Bitcoin? I only found out about these 3 coins yesterday, and am excited to share them with you! Tell me what you think about them in the comments section below. Credit goes to Twitter user @Tasorrog for introducing me to 2 of the coins I will be talking about here; eMunie, and SkyCoin. Lastly, I will also discuss another interesting altcoin, EarthCoin, that has some unique technical specifications, and also gained much attention since the 20th of December. eMunie (eMu) was first announced sometime in June 2013, and has been in Beta testing since. It kinda went into hiatus for a few months, before picking up some momentum and attention again this month as people anticipate its official launch in January 2014. "The entire beginning total of Emus will be created in 1 genesis block. Anyone can invest during the 30 day pre-launch investment period. The cost is .10 cents per Emu. So if the entire investment is $1 million, then the genesis block will contain 10 million Emus. Later as demand for emus increase, to keep price for going up dramatically, more emus will be "hatched" and those will be dispersed to both hatchers and coin holders. So by owning coins you will receive a % of the new coins. So there is eventually a limitless amount of Emu that will be created. It will depend on demand." This will in turn keep prices more consistent, with a more sustainable growth compared to existing cryptocurrencies. In addition, it is also an attempt to improve fairness in coin distribution, and reduce susceptibility to Pump & Dump schemes. To achieve this, eMunie will be launching with a pre-sale. Timb, a beta tester, pointed out on this thread about the pre-buys that there will be 100,000 EMUs available for the public during this pre-sale, and also discussed how the initial developers, contributors & beta testers will be rewarded for the work thus far. The pre-sale will last for 30 days. The exact date of pre-sale has not been confirmed, and was mentioned it will be delayed and would take a few more weeks, and that there's "no rush to completion by the developer". I'm assuming this will be sometime end January, or early February, but don't take my word for it. To get the latest updates, sign up and be part of the pre-sale for eMunies by simply sending an email to prelaunch@emunie.com and they'll add you onto the list. For more information about the Pre-sale, please visit this comprehensive eMunie Pre-sale FAQ thread. SkyCoin (SKY) made its prelaunch announcement on the 22nd of December 2013. It has a total supply of 100 million coins, which like NXTcoin, requires no mining and all coins are already on the market. It uses the Proof-of-stake (PoS) system instead the Proof-of-work (PoW) system used by Bitcoin, and hence completely removes the mining process. Uses protocol called Obelisk instead of PoW. Obelisk is a provably secure PoW alternative for creating fair total orderings in decentralized systems with adversarial nodes. Obelisk was chosen over other proposals because it is provably secure and can be layered over Bitcoin's existing security model to eliminate the possibility of 51% attacks. Transactions are free. Users receive coin-hours for each hour they hold a coin. Coin-hours are spent on transaction fees. Transactions bid to enter a fixed sized block. Transactions are fast. Most transactions are executed within fifteen seconds. Off blockchain transactions are instant. Inflation capped at 2% per year. Inflation will be used to fund open-source projects which enrich the community. Skycoin stakeholders will have per-project governance over project funding. Depending on SKYcoin's entry-to-market price, we could see it grow in a similar fashion to NXT, as they both have rather similar specifications. I'm still unsure when SKY will officially launch, if someone out there knows, please let me know! Note: This should not be confused with a dying altcoin, also named SkyCoin (SYC), but with a different ticker name. EarthCoin (EAC) also recently launched less than a week ago, and a Bitcointalk forum post that started on the 20th of December has generated large amounts of attention and discussions, with over 75 pages of replies as of today. Apparently, the launch also attracted so much attention that the mining difficulty increased from 1 to 9 on the first day, before falling back down to 6. "EarthCoin uses a 365 day period. It will start with 10,000 coins per block, and it varies in a sine curve with amplitude of 2,000, with a period of one year (like the Earth moving around the Sun). This means that you start with 10,000 coins, and it adjusts at each block, reaches a maximum of 12,000 coins per block after about 3 months, then it will descend gradually to approx 10,000 coins per block again at about 6 months. Then a new minimum of 8000 coins per block at about 9 months. Then we reverse that – to climb and return to 10,000 coins per block at one year, before finally cutting the payout in half." Lastly, I just wanted to comment on the issue of premining around EarthCoin. In again another of Hazard's post, this time calling EarthCoin a scamcoin because of the premine. There have been tons of coins with premines popping up lately, and it's sad to see that many have simply dismissed some potential altcoins because of the failure of others. Here's another discussion about the premine on Reddit. In the case of EarthCoin, only 2% is premined, and is said to be "for promotions, giveaway, bounties, dev and long term support." First of all, they were transparent about it, and I think it is a rather reasonable rate. Of course, this is provided that the developers use the funds wisely, and aim for a fair distribution of the premined coins in exchange for a larger adoption/reach. I have no clue how this is going to go in the end, but I don't have incredibly high hopes for it either. The main reason I have highlighted EarthCoin is because it is new, there is large interest in it, and is not currently on any exchange which means that we can expect a large growth as an early adopter. This is only a preliminary investigation into these 3 cryptocurrencies. Please invest at your own risk. If you have questions or comments, feel free to leave them in the comments section below! "Be fearful when others are greedy; and be greedy when others are fearful." To end off, I'd like to share a video by Chris Dunn, a technical analysis & short term trader, whom I have been following for the last 3 or so weeks. He has made very good Bitcoin predictions over the last weeks (whether it's just luck or not, you decide for yourself), and also gives very good insight into understanding market psychology as a way to beat the market. If you like it, watch his other videos as well, and follow him on twitter @ChrisDunnTV. Over the last few days, I have been looking into a few potential alternative cryptocurrencies that have caught my eye. Follow me on Twitter to get the latest updates. Researching into more potential alt coins: NXTcoin (NXT), SecureCoin (SEC), Noirbits (NRB), YACoin (YAC), Argentum (ARG), WorldCoin (WDC). Alt coins that interest me: NXTcoin (NXT), WorldCoin (WDC), Globe (GLB), Dogecoin (DOGE). Anyone know anything, tell me more! Disclaimer: Invest at your own risk! Among those that I tweeted about, I think that there are a few worth mentioning. 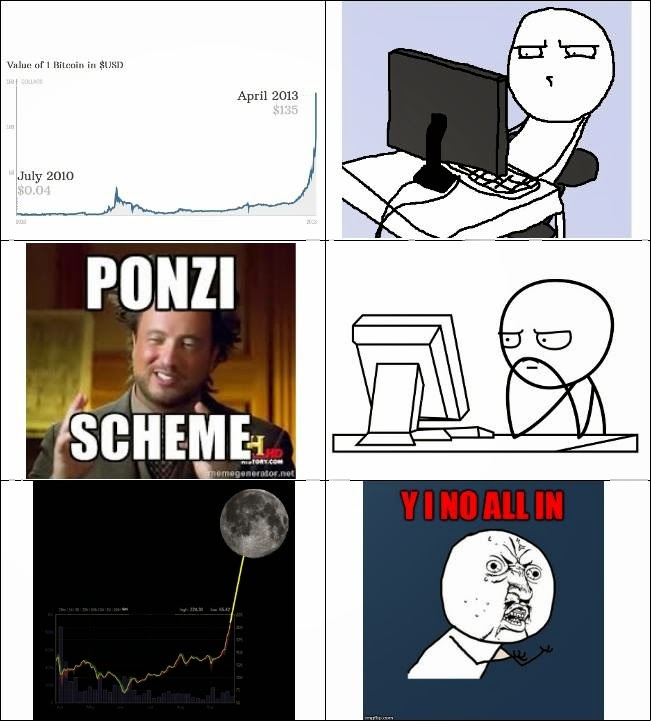 One of them is is WorldCoin (check out their really awesome homepage here). I have not examined it thoroughly, but it does look like they have a strong development and marketing team behind them. What is distinct about WDC is that it boasts a block time of only 30 seconds, and is currently tied with Franko as the coin with the fastest transaction times. Read WorldCoin's full specifications on Cryptocointalk. In addition, The Worldcoin Foundation is about to launch Scharmbeck, an "an online FinCen approved Worldcoin financial service", that acts as a secure online wallet and exchange, much like Coinbase. Read more about Scharmbeck on this Facebook post, and this Reddit discussion. However, there are also some bad points about this coin, including a premine (read more here), as pointed out by Hazard. "We would like to comment on the Hazard post if you will allow us. Please recognize that Hazard is a known Worldcoin hate-monger and has twisted much into a smear campaign. I will quickly rebuttle a few things he brings up. Number one there are many people involved in Worldcoin. This means that if we were in fact going to insta or premine then 400k would not even be close to a suitable level. Let's keep in mind there was 35 million coins. 400k divided by 10+ early adopters would mean but 40k, or less, each. This was hardly a pre or insta mine, nor was it an unfair release. There are no "whales" holding more then 1% of WDC unless they have done so fairly. Secondly our connection to real solid was that of a bug fix. He did help us fix a 51% attack but we otherwise have no connection. We are also in the midst of releasing a fix to stop 51% attacks completely. Lastly I would like to clarify why Hazard dislikes us. He was an early supporter of UNOCS and lost money in it. UNOCS was a failed business attempt but certainly not a scam. No one came out on top during it, it just did not come to fruition as intended. Many people lost money during it's collapse but I must reassure everyone that we are NOT UNOCS. Yes a developer was involved but no that is not the direction we are taking with this. Scharmbeck is real and about to enter beta, with a huge media release. It is not a failed attempt as it is already fully working. Please reconsider using any "Hazard" posts as an example of Worldcoin information. We can promise you that his "news" is nothing but false claims and negative hype." WorldCoin does indeed have some controversial issues surrounding it. But I personally believe in its potential for growth, based on the work that the development team and community are putting in. If you'd like to purchase WorldCoins with Bitcoin and Litecoin, head on to Cryptsy.com and get trading! WorldCoin has already been around since May 2013, and has only recently picked up more traction with the new marketing and a growing community. However, and more interestingly, I want to investigate these very new cryptocurrencies; NXT, and DogeCoin. NXTcoin (NXT) is a new cryptocurrency that is branding itself as a 2nd generation crypto that uses "a 100% new Proof of Stake currency with many exciting features in the pipline". It has 1 billion total coins, that are ALREADY fully in circulation. Mind-boggling huh. Read NXTcoin's specifications here on Cryptocointalk here. In fact, NXT has not officially launched yet. Read more about NXT on this wiki. No promotional webite - every coin needs a basic 'go to' official website to show they're a genuine product. No Cryptsy support - traders of smaller crytpo-currencies love using Cryptsy, so talks need to begin to get this started. Poor GUI - The actual visuals are great but the need to load a command prompt first makes the whole thing seem clunky, a single executable file is needed. Tech support - A single email you could contact (on an official website) for all tech support issues would be great. I honestly think someone who has a big investment in NXTCoins could dedicate 30mins of their day to answer questions. Lastly, this unofficial NXT forum is also a great treasure trove of information about this new cryptocoin. Read more here. If you are interested in purchasing some NXT, you can do so at this exchange, Dgex.com. I have tried it myself and seems to be legit, although it is quite difficult to get a position closed. If you have any questions, feel free to ask in the comments section below. You can also view NXT market prices on this spreadsheet. 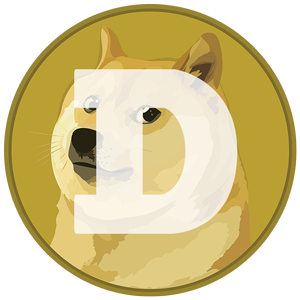 DogeCoin (DOGE) is a totally ridiculous coin that is basically a clone of Litecoin with a shorter block time of 60 seconds (Source: Cryptocointalk - Dogecoin). In the short time since its launch, the DogeCoin Subreddit has grown to a size of 2500 subscribers, or as they like to call it, "rich shibes". You can find the current trading prices of DogeCoin at these sites, Dogepay, and DOGE Calc. I don't know how this is going to go, and it still sounds ridiculous to me. But in the alternative cryptocoin scene, I've found out that, albiet unfair, early adopters always win. If you're interested to buy them, there are currently two options. Buy them from other sellers on forums, such as this subreddit, or this doge forum here. I personally don't recommend the first option, because there are lots of scammers out there on the Internet. The second option is to buy them from an exchange, currently there's only one that I know of; CoinedUp. Well, this is just a preliminary investigation into these potential alt coins. Please do not take this as investment advice. Do your own research before investing in any cryptocoin! If you're interested to see how other crypto enthusiasts' portfolios look like, check out this Reddit discussion: What does your Crypto Portfolio look like? I hope this post was helpful for you. If you have any questions, please shoot away in the comments section below! Wishing you an awesome week ahead, peace. As I have mentioned in my previous post, there are two main arguments against Quark (QRK). First of all, the biggest argument lies in the "premining" issue. Let me clarify again, that Quarks were not "premined"! Instead, Quark was launched such that only a small number of early adopters were able to mine a majority of coins within 6 month timespan (99.64% already mined). However, the interesting thing about having almost all the supply out there, is that the price of Quark will stabilize much much faster than Bitcoin. Because Bitcoin will take another 20 odd years to be completely mined out, we could be speculating on the price for much longer than Quark. Secondly, having a few people own a large number of coins leads to our second argument. How then, can we ensure a fair distribution of Quarks to the rest of the market, following the 6 month accelerated mining period? Sure, we can argue that it's unfair because the early miners get to sell the Quarks for massive profits. But doesn't that also apply to any other cryptocoin? In fact, the issue of fairness is as prevalant in Bitcoin as well as other cryptocoin mining. Bitcoin's mining power is currently being hoarded by the ASIC miners, which in turn gives GPU & CPU miners very little room for profitability. By limiting Quark mining to CPUs only, this can be argued to actually be more beneficial to the community, although it also does bring about a potential problem of Botnets mining from user's computers without their permission. If we look at Bitcoin, it is clear that first-mover advantage is crucial as we can see with Bitcoin's clear lead in the Cryptocurrency market. However, this is not the only reason behind Bitcoin's success. Looking at the landscape chart below, we can see that the Bitcoin infrastructure is well developed with many services competing in various sectors, who are ultimately cooperating to build an ecosystem currently unrivalled by any other cryptocurrency. In the context of Quark, the community has also been working hard to build up an extensive infrastructure and network. They have revamped their website to make it look much cleaner, and are already in the midst of launching Quarkspend, an ecommerce platform that uses Quark as currency of choice. I love the energy coming from the Quark community. The work of the community is commendable, and is a prime example of the power of crowdsourcing. The community, not unlike the currency itself, is decentralized and each individual contributes his expertise with a common goal of developing the Quark ecosystem. "find out the path Megacoin took to promote Mega and build on it. Megacoin adds nothing new to Altcoins but look at the price, they are doing their marketing perfectly. Since Quark actually has something new to offer in the world of Cryptocurrency building upon Megacoin's marketing plan will increase the price at least 5x over." Before we investigate the factors driving the success of MegaCoin, I'll first discuss about ZetaCoin. Like Quark, Zetacoin (ZET) has a supply of 160 million coins that will be mined out within a year, with a "small yearly inflation" (as can be seen here). And as such, will also see a quick consolidation in price, followed by a deflationary price for ZetaCoin. In this sense, we can similarly argue that ZetaCoin is to Quark, as Litecoin is like silver is to Bitcoin's gold. Over the last week, ZetaCoin has skyrocketed to its current 11th position on Coinmarketcap. ZetaCoin's value has grown about 5 fold over the last 4 days against BTC, from a low of 0.012 to a high of 0.12 and a current rate of 0.07. Moreover, the ZetaCoin dollar value has also increased from its sub $0.01 price to a current value of $0.065. I also like the work of the development and community team at ZetaCoin. Unlike most other cryptocoin communities who use Forums to collaborate on their projects, ZetaCoin uses the Cryptocoin Social Network, Nobs.is, to discuss and develop their marketing efforts. The team is still young and there's still much work to be done, but I believe that they have a strong and motivated community, and are on the right track to making ZetaCoin succeed. Quark, similarly, has also exploded into 4th place on Coinmarketcap. I still stand by my prediction that Quark prices will soon experience the Keiser Effect. And in the context of the analogy of ZetaCoin to Quark, I do believe that there is a huge potential for ZetaCoin to follow Quark's price. Just saying. MegaCoin (MEC) launched in June 2013, and is a clone of Litecoin's scrypt crypto. It has a rather interesting specification which generates half of the total 42 million coins in the first 5 months, while the rest will be released over the decades with increased difficulty. The intriguing thing about MegaCoin is that it has climbed to the 7th position on Coinmarketcap in the short time that it has been around. As such, we will take MegaCoin as a case study to explore how the other cryptocurrencies can learn from them to better brand and market their cryptocoins. With a quick content analysis of the MegaCoin website, we can see a well-built website, with a clean simple design, and full of useful links. Apart from the usual informational and download links, I want to also highlight how they have implemented a "shopping & services" tab to allow users to easily spend MegaCoin, a community link for easy access by users, as well as links to their social media accounts. The website also boasts a wide range of translated versions, with 15 different languages, including English, Mandarin, Korean, and many other European languages. We can also find an active community of MegaCoin supporters on their forum and the Reddit page. With this, I would like to make a few suggestions for the Quark and Zetacoin community. ZetaCoin should build a platform to allow users to spend their cryptocoins. I hope this article has helped you better understand some of the external factors that drive a Crytpocurrency's adoption and price. It will also be interesting to also examine and compare the other leading alternative cryptocurrencies. With most of them being simply a fork of or a clone of Bitcoin/Litecoin, I'm really curious about what determines a certain cryptocurrency's price (besides it's technical characteristics). Of course, first-mover advantage is crucial, as we can see with Bitcoin's clear lead. But I have a hunch that the community, branding, and marketing of a cryptocurrency also play a big role in its success. Quarkcoin (QRK) is a Pump & Dump - Or Is It Really? If you still don't know what Quarkcoin (QRK) is, Jason explains it pretty well in his recent video below. Since Bill Still talked about Quark in his recent video, it has exploded within the Bitcoin community and has received huge critism, with many dismissing it as a "scamcoin" or a "pump and dump" scheme. See the Reddit discussions below for more information. Reddit: Are we being mislead by Quarkcoin Propaganda? Apart from Quark being more secure by using 6 different hashing algorithms, I have yet to be able to find any substantial evidence that this coin is "not a scam" or "better" than most other alts out there. The conversations about Quark have exploded in Reddit over the last few days, and the most asked question is regarding the issue of 98.9% of the Quarks being already mined out. In fact, almost everyone in the Bitcoin community has been calling Quark a scam, and saying that the heavily vested (Max Keiser & Bill Still) are overhyping a premined coin for their own profits. However, someone like Bill Still or Max Keiser pumping a "useless" coin solely for their own benefits seems like a stupid thing to do. In my opinion, there has to be a better reason as to why they really believe so! Also, I want to emphasize that Quarks were NOT pre-mined! Instead, the 98% of Quarks that have already been mined were mined by a community of ~100 or so people, who in the case of Quark, will be the central nodes of distribution for Quarks. This then leads to the more important question, how can the Quarks held by 100 people be fairly distributed among the rest of the new adopters? This was covered in depth in a few discussions that I found, but there is still no concrete answer to the question posed. The closest answer we have lies in Quark's design. QRK is designed in a way that only CPU mining is efficient. Quark is being mined during a short period of time, which discourages GPU or ASIC miners and keeps the coin fair since Developing ASIC miners takes considerable time and man power. Quarks are mostly mined by early miners, and have been well distributed before the value of this coin goes high like Bitcoin. So there are no ASIC miners and hence we don't have a case where a minority of privileged people mining using specialized hardware gain big profits. From this point of view, Quark is more decentralized since virtually everyone (rather than certain groups of people with special hardware) can mine it; the likelihood of monopolization is smaller. Secondly, from the official information posted on Cryptocointalk, it is interesting to note that the supply of QRK is inflationary, wtih a total of 247 million QRK will be mined in ~ 6 months, after that ~ 1 million QRK p.a. (~ 0.5% p.a inflation). This is interesting because it is a completely opposite take on Bitcoin's limited supply. And this means that the value of QRK is deflationary. Secure and different Hashing algorithm. 9 rounds of hashing from 6 hashing functions, rather than a single Hash function, which most coins use. Although the single hash function is considered sufficient at present, the multiple hash gives a further layer of security against future unknowns. Rapid block generation times. The block generation time for QRK is 30 seconds against 10 minutes for BTC. A rapid decrease in the Mining Subsidy. This increases scarcity at a greater rate: the newly mined coins available for sale do not affect market price as much as other alternative currencies. I have also compiled some Quarkcoin related news, which I recommed you watch/read before investing in Quark. After doing this preliminary research, I still have no clue as to whether or not Quark will be here to stay. On the other hand, Quarks will soon experience the Keiser Effect, and I'm not going to miss this boat. I will continue to research into Quark, and buy more (as the price decreases, just my prediction) until it rises after the 19th of December, when Keiser Report airs. Don't forget to vote on my Quark poll on the right column! Also, please tell me what you think in the comments section. Whether not you agree or disagree with me, I just want to know what you think, so shoot me! Another coin to watch is Zetacoin, which also has an infinitely inflationary supply. Read up more about Zetacoin by clicking here. Also, watch out for Bitcoinsachs' upcoming blog post or follow his Twitter account @BitcoinSachs. Might cover that over the weekend. Stay tuned! 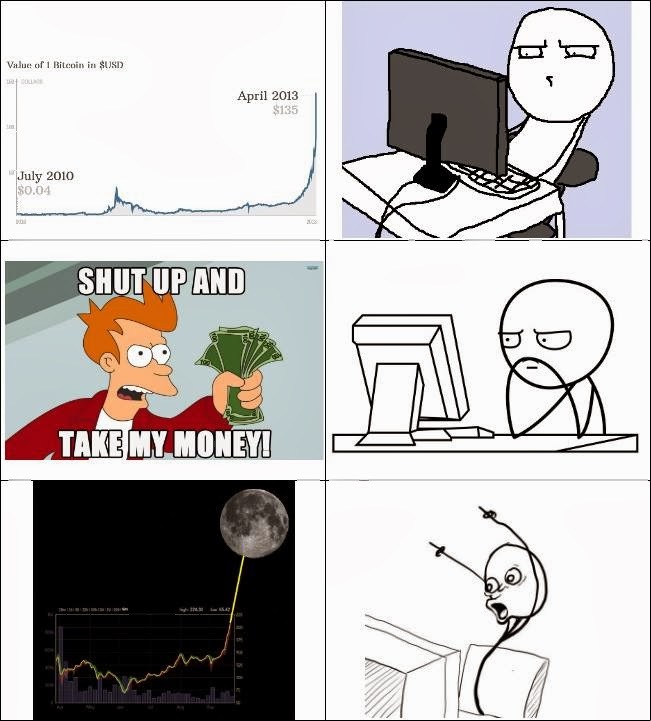 All this Bitcoin craze has inspired me to make my first Meme ever! I call it To Le Moon, enjoy! Do you wanna be this guy? Insider News and Predictions: Eyes on Quarkcoin & Zetacoin - The Future of Crytpo Currency? Since I mentioned a resistance/support of $50/$25 for LTC in my post from 2 days ago, LTC prices have found it's support at $23.51, and has risen over the last 4 hours to it's current BTC-e price of about $32. Hold on tight to your Litecoins because I think prices are going to continue going up and break the $50 resistance by Friday, probably earlier. I wasn't thinking of writing a post today, and I still owe you a post about Panic selling/buying & Bull/Bear traps, but I found some interesting topics to write about that will interest you altcoin and crypto junkies. What really triggered this blog post was a tweet I saw by Keiser, featuring Quarkcoin (QRK) alongside Bitcoin and Litecoin as the cryptocurrenies of choice. I first saw the word Quarkcoin when it broke into the top 10 market cap with over 300% increase in market capaitalization value overnight. If Jesus were born today, the 3 wise men would bring him BTC, LTC and Quark. If Keiser said it, it has to be worth something. With his reach and influence within the Bitcoin community, we could see a huge jump in Quark prices soon, even if it doesn't have much value. From my research so far, I found out that Quark uses nine rounds of secure hashing from six different algorithms to make Quark transactions super secure. Many programmers have been worried about whether or not the Bitcoin protocol is hackable, but Quark has just made it even closer to impossible by using a mix of algorithms. On the other hand, what intrigues me is that 98.9% of the Quarks have already been mined (see the Reddit discussion here), which makes me wonder how this is a good thing. If you know how this is beneficial to the community, please drop a comment down below! Greatly appreciated! Apparently the prices surged after a video of Bill Still, a legendary Economics cult figure went viral among the Bitcoin community. What's notable is that Bill will be appearing on a Keiser Report interview, which airs on the 19th of December, so keep your eyes peeled. And lastly, we could see Quark on a Chinese exchange over the next few days. If this is true, you better get your Quarks as soon as you can! http://t.co/3hKy9t93DS WILL INTRODUCE QRK IN THE COMING DAYS!! CHINA IS COMING!! During my research into Quark, I found out about Zetacoin (ZET). The prices of Zetacoin have increased 550% against the bitcoin, with ZET/BTC prices skyrocketing from 0.0065 at the beginning of 30th November to a peak of 0.055 and is currently hovering around 0.036 at the time of posting (Source: Cryptocoincharts.com). Looking into Zetacoin, I found that it actually has an inflationary characteristic. There are a total of 160 million Zetacoins, and upon the depletion of this initial supply, 1 million additional Zetacoins will be added to the supply every year. This is quite a different take from the limited supply of all other cryptocurrencies, and could be an interesting tweak that can potentially solve some of Bitcoin's existing limitations. I'm still not entirely sure about the benefit and utility of Zetacoin, but I'm going to jump on the bandwagon and bet on the hype of the Zetacoin, while I do more research over the next few days. Deposits take way longer than they should. Bitcoin deposits take about 45mins to 2 hours. Cancellation of open orders will result in your funds being "stuck" in limbo for up to an hour. It took 45 mins for my account verification email to arrive. Interface is less responsive (laggier) than I would prefer. I think its just a problem with them being unable to handle the surge in traffic over the last 5 days, and I hope that fix it soon. But apart from these problems, looks really good, and I'm definitely using this over BTC-e from now on. The Altcoin craze: What coin should I hold on to? Altcoins have been the rave over the last 5 days since Litecoin's prices surged past $10. Now that Litecoin has found a resistance at $50, and support at $25, what's next? As predicted, Litecoin was a bubble in the making, and made a mini crash which began on the 28th November from $50/LTC to about $25.56 4 hours ago. Prices look like that have begun to climb back up again, and I won't be surprised to see LTC at $50 again within a week. Unfortunately, even though I predicted the impending "mini bubble" of LTC, I didn't manage to trade them out into BTC at the peak. In fact, I actually bought some more Litecoins at 0.05 (LTC/BTC). Not the best move, but I'm still happy with my Litecoins. Over the course of 1 month, Litecoin market capitalization increased over 2000%. 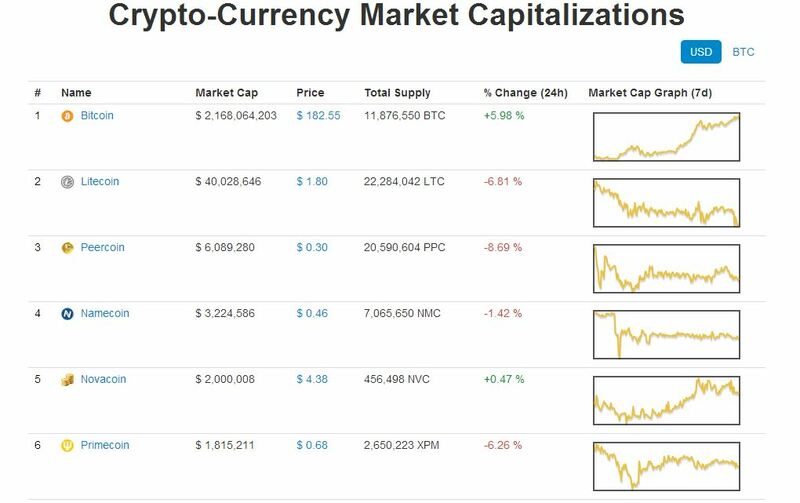 The rest of the top alt coins also saw large increases in market cap with Peercoin (PPC) gaining 1100%, with Namecoin (NMC) and Primecoin (XPM) following behind with a 1700% and 850% gain respectively. During the month of November, almost all major altcoins outperformed Bitcoin's 600% increase in market capitalization during the same period. For your viewing pleasure, I have set them up in a nice, borderless table for a comparison of market cap gains over the last 2 days. I'm sorry to you NovaCoin fans for leaving NVC out of the equation, but I read about some pre-mining & other issues with the development team somewhere, so I'm staying away. With a quick look at http://altcoins.com/, we can see the two greatest gainers were PPC and FTC, which have nothing in common in terms of the algorithm. Alternative Coin prices are purely based on speculation right now, as can be seen by the huge rally quickly following behind Litecoin's rise to fame. If you're planning to dabble in some alt coins besides Litecoin, and have a high risk propensity, this may be the best time to risk your money for the possibility of massive gains. By massive, I'm talking about a minimum of a 5 fold increase in USD value (or even Bitcoin value if you're lucky enough). I'm not really a person for predictions, but this situation calls for one. As mentioned, I (personally) believe that alt coin prices are following behind LTC prices, ever so slightly. 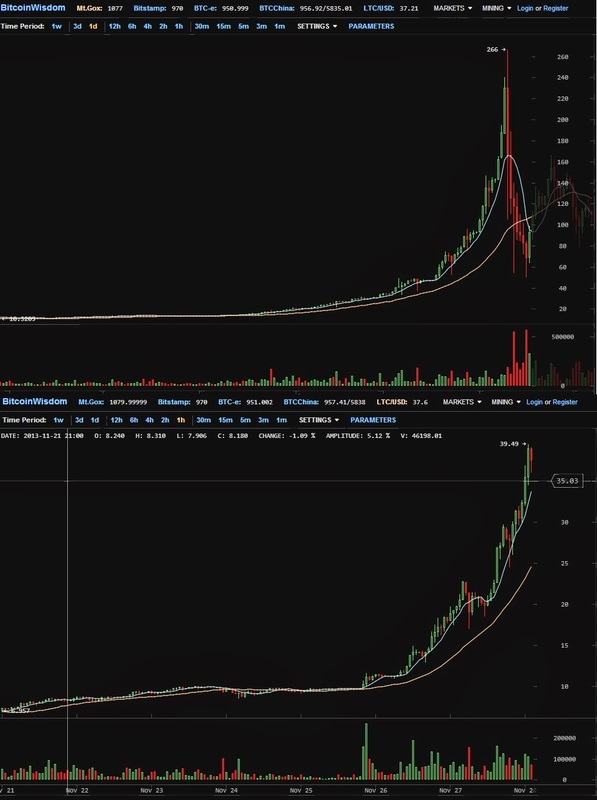 You can get to see the latest price movements with my favourite Bitcoin chart to date: Bitcoinwisdom.com. On Bitcoinwisdom, use the 1m chart to see the prices as they trade live, and you can even choose between different markets from the bar at the top making it much easier to compare prices across different exchanges. If you're new to chart reading, please check out their help page @ http://bitcoinwisdom.com/help/charts. If you need a better explaination, comment below and I'll be more than happy to help. Use Bitcoinwisdom's chart to see when Litecoin prices are going up (which I think is happening now, with a resistance of $50 and a support at $25), and invest in your trusted alt coins when you think it is happening! If I had to name one, I'd go with NMC! If you prefer something with a higher risk, try FTC & XPM. Trade with your heart, not with your mind. Trade safe, and HUAT AH! On the left, we have 2 candles pointed out by the blue arrows which illustrates my point. First arrow shows a candle with a huge dip downwards, and price retracts to close to the top within a minute or so. After which, prices will start to bleed downwards. This is the same for the 2nd blue arrow, but in the opposite direction (upward trending). On another note, I just wanted to also point out the candle pointed out by the red arrow. Such a significant (in size) and opposite trending candle, following a "peak" as shown by the previous 3 arrows, usually means that a downtrend is coming. Or at least that's what I've learnt from my 2 month experience analyzing Cryptocurrency charts. I also found a very interesting theory that is applicable to the crytpo markets. If you are interested in trading your Bitcoins, be sure to read up on Elliott Wave Theory. Alternate Cryptocurrency Prices Surge - Is a Litecoin Crash coming? BTC surpassed its all time high, reaching a milestone US$1000 per Bitcoin on Mtgox earlier today. As BTC's prices slowly inch up after the mini-crash after the Senate Hearing, we have seen a large spillover of funds pouring into alternate cryptocurrencies. Over the last 2 days alone, the prices of alt coins such as PeerCoin (PPC), NameCoin (NMC), PrimeCoin (XPM), and FeatherCoin (FTC), have at least doubled in value, some up to 500%. Most notable is Litecoin, dubbed as silver to Bitcoin's gold, which price recently surged and increased almost 10 fold in the last 10 days since it passed the $4 mark. Since the last 60 hours, Litecoin has more than tripled from $10 per LTC to its current price of US$35/LTC! Not exactly sure what's behind this surge in prices, especially in LTC, but maybe Max Keiser's Interim target of $50 for LTC played a part. But this insane surge has got me thinking, is a huge crash in the making? 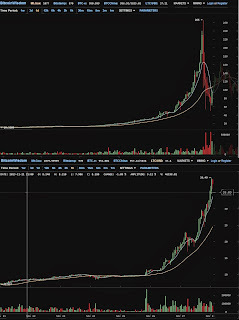 If we look back at the April crash, and compare it with the current litecoin chart, we can see some similarities. See below for a comparison. From my understanding of the markets thus far, I am assuming that every big spike in price has to be followed by a big correction. The higher you jump, the harder you fall. And let's say that Litecoin prices are kind of mimicking Bitcoin prices (as it was back in April 2013), albiet at a much faster pace, we can assume that this crash is coming. And it's coming very soon. But when will that happen? Where will the peak be? Will LTC prices peak at $50, $80, $100, or $200 before it takes an 80% nosedive? I can't tell for certain what price LTC will peak at before crashing, but what is your guess? If you're holding Litecoins or thinking of buying them, read these 2 reddit discussions before doing so! Well my plan for the next few days is to convert some of my LTC back into BTC. I think BTC prices will hold rather stable even when LTC flash crashes, and thus would rather sell my LTC into BTC than hold onto useless FIAT dollars. I currently have about 80% of my funds in LTC, and have placed sell positions for half of my Litecoins, ranging from 0.055 LTC/BTC all the way up to 0.15. And will be looking to re-enter into litecoin at the bottom of the crash, if the crash comes. Crash or no crash; all the best for your trading everyone! So, what's your move going to be in the case of a Litecoin crash? On the 18th of November at 8PM GMT+0, Homeland Security will hold the first of two hearings about Bitcoin and the future of cryptocurrency after Silkroad. I believe these hearings will have a negative impact on Bitcoin prices, and here's why. The FBI probed for investigations into Bitcoin, following the statement: “Indeed, it is not clear at this point whether virtual currencies will become a long-term, prevalent fixture of the electronic commerce world. But given the increased demand from consumers and investors, as well as demonstrated concerns regarding money laundering, regulators would be remiss if they turned a blind eye to virtual currencies,” Mr. Lawsky said in Thursday’s announcement. FinCEN is dedicated to learning more about digital currency systems, along with other emerging mechanisms, to protect those systems from abuse and to aid law enforcement in ensuring that they are getting the leads and information they need to prosecute the criminal actors. announcing that he will hold hearings that could help determine whether virtual currency companies will need to apply for a special “bitlicense” to operate in the state. Acting Assistant Attorney General Mythili Raman said: “As charged, Liberty Reserve operated, on an enormous scale, a digital currency system designed to provide cyber and other criminals with a way to launder their profits without leaving a trace. The company’s very purpose was to launder its users’ criminal proceeds through the U.S. and global financial system. Ed Lowery, special agent in charge of the U.S. Secret Service's criminal investigative division, said the agency is working "aggressively with our international partners" to pursue cyber crime and the companies that permit the misuse of digital currencies. He declined to comment specifically on Bitcoin. Jeff Berwick on Fox Business: Is Bitcoin the currency of the future? Could be a good time to sell tomorrow before the talks start. We could see prices back ab sub-300 or even sub-200 levels. Let's wait and see. Is the Bitcoin train ever turning back? $1000 by year end? Could it be that the Bitcoin train is never ever turning back from here? Since BTC prices soared past the previous April high of $266, it's been surging up to a high of $440 and building up a resistance level, hitting this peak for the second time in 12 hours. On the 5 day chart, we can form a support at $370. I think this resistance and support levels are highly significant now, and my guess is that the BTC prices will be hovering between $370-$440 (MtGox price) for a good 4 days, at least until the 18th of November. If it breaks above this resistance, I feel like the train is never turning back. Will we ever see bitcoin prices at $250, or even $300, ever again? Some of you may already know about the Homeland Security hearing on the 18th of November. Why is this important? Well, it really depends on the outcome. But judging from how the US is treating Bitcoins now, siezing MtGox bank accounts, silkroad etc., I'm skeptical about any good news coming out of this hearing. If it's bad news, we could easily see prices slide to $266, or even way below $200. Otherwise, if news is neutral or positive, we could see Bitcoin prices soar to $800, even $1000, by the end of the year. In the past month, some big names in Bitcoin and businesses have valued Bitcoin at $100k, even $1 million. Do you think that's possible? Tell me in the comments below. Bitcoin's rising demand can also be attributred to more businesses offering BTC as a payment option, since Baidu first did so on 22st October 2013. Some notable brands include Shopify, Subway, with eBay considering it. While in China, you can buy real estate with BTC, and beer for BTC in Singapore! On the other hand, there have also been a significant increase in the number of hackings. Several exchanges have fallen just this month alone, along with some wallet services such as inputs.io. Could the vulnerability of such services compromise the price of Bitcoins significantly? 3) calculate values needed to support the transactional value. I personally agree with the third method, because I believe that the value of Bitcoins are purely dependent on demand, which is in turn increased as more services are built to make it easier transact in cryptocurrncies. Of course, political and regulatory factors will also have a large effect on Bitcoin prices. So lets see what happens on the 18th of November 2013. Have comments? Share them with us below!